A day of jam-packed stunting! DistinXion provides stunt clinics for your squad at your school! This is a great option for teams that are looking for more instruction specifically with stunting. The stunt clinic will include a full DistinXion stunt group to demonstrate execution, techniques, and grips. This will be catered specifically to your squad’s abilities. The information below describes an outline of the Stunt Clinic model. When you’re ready to schedule a clinic, fill out the form below! DistinXion Cheerleading Stunt Clinics are private team camp at your school with our staff specifically designed for stunting. These clinics will include stunt training as well as character development. Stunting: The stunt material includes basic to advanced stunts. Campers and coaches will have the opportunity to learn a range of transitional stunts, dismounts, and pyramid options. Our material will be specialized to the coach’s request and customized for a squad’s strengths and weaknesses. Character: The character training includes lessons on attitude, humility, respect, serving others, and more. Character training will be integrated into camp to encourage squad bonding and the development of each cheerleader’s personal character, including improving their self-esteem. Staff: DistinXion Cheerleading staff is made up of current/recent college cheerleaders that are a select group recommended by their college coaches and chosen for our staff based on their elite cheerleading talents and for their high character. Our past cheer staff included cheerleaders from colleges such as Indiana University, Butler University, Ball State, and Grace College. 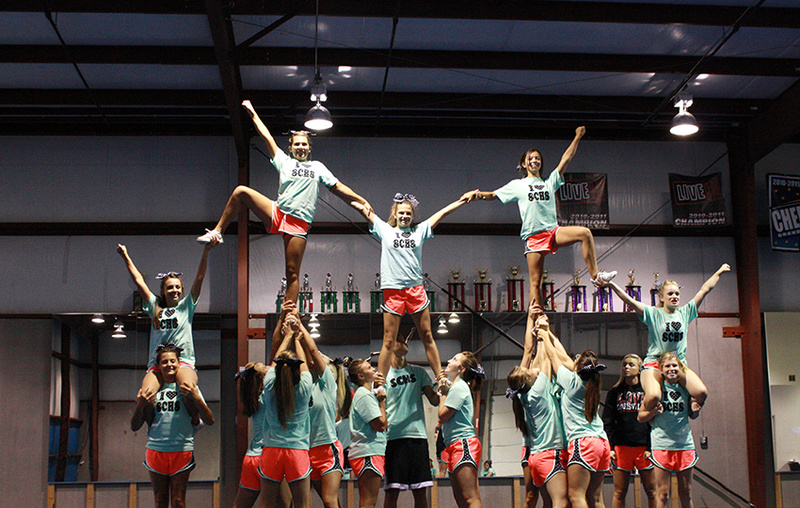 We offer one of the best camper-cheer staff ratios with at least 4 DistinXion staff present at every camp! Camp Schedule: 1-Day Private Team Stunt Clinic is 10:00AM to 3:00PM unless otherwise specified. Sign-Up Deadline: One month in advance. Fee: Clinic Pricing is based on the number of cheerleaders attending each camp. Want to get the camp price even lower? Invite your junior high squad and/or neighboring school squads. We’ll increase our staff and decrease the price – it’s a WIN-WIN! Additional Details: Each cheerleader must have a parent signed Release/Waiver form before participating in a stunt clinic, however, DistinXion is only required to get one release/waiver per year for every camp participant. If your squad also attended a DXN camp, we will have all of their waivers on file and will not need a new waiver for the stunt clinic. Schedule a DistinXion Cheer stunt clinic. Contact us about scheduling a DistinXion stunt clinic by filling out the form below. We will personally contact you within 2 business days!